CNN interviews Prime Minister Binyamin Netanyahu, who reacts to poll showing that anti-Semitism is alive and well in Europe. 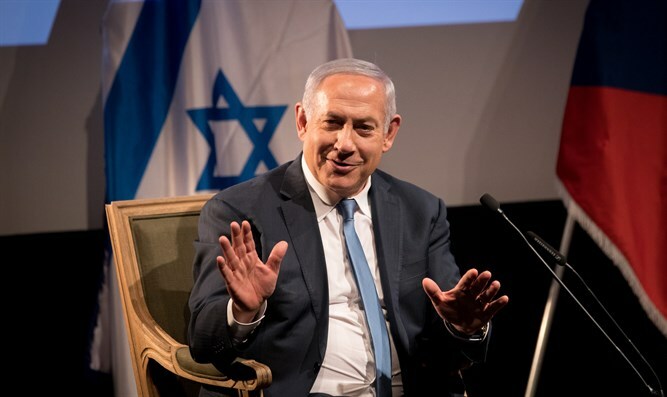 Prime Minister Binyamin Netanyahu was interviewed by CNN on Tuesday, and reacted to the poll which discovered that one out of five Europeans justifies anti-Semitism and that anti-Semitic stereotypes are alive and well in Europe. Prime Minister Netanyahu, thank you for sitting down with us. Anti-Semitism in Europe is nothing new, but the results of our survey are still quite striking. More than a quarter of Europeans believe that Jews have too much influence in politics and finance. Twenty percent believe that anti-Semitism is a response to the everyday actions of Jews. You travel to Europe often, you meet the leaders there. Are you surprised? "I’m concerned because I think anti-Semitism is an ancient disease that rears its ugly head. It first attacks the Jews, but it never stops with them. It then sweeps entire societies. It happened obviously in mid-century Europe, first in Germany and then throughout all of Europe, and the consequences were horrible. Yes, I’m concerned but I think we have to fight it and we are fighting it. Most of the European countries’ governments, I commend them for fighting anti-Semitism." It’s easy to sit here and make statements and say never again every Holocaust memorial day, but that’s not going to end this. Do you see the concrete actions that have to happen here on the part of European countries? "Well, let’s distinguish between two things – first, the source of anti-Semitism. There’s old anti-Semitism in Europe that came from the extreme Right, but there’s also new anti-Semitism that comes from the extreme Left and also the radical Islamic pockets in Europe that spew forth these slanders and lies about Israel, the only democracy in this entire region, the only one that has the courts, human rights, rights for all religions, gays, everything, I mean, the whole thing is ridiculous. I mean, the attacks on Israel, the one carrier of European values in the Middle East is absurd, and it’s absurd twice, not only because of what I just said but because six million Jews were annihilated on the soil of Europe, and to have anti-Semitism is particularly offensive absurdity of history. "So yes, I’m concerned with that, but again, what do I see? Number one, I see European governments, I spoke to Merkel, Macron, and May and others, they’re putting up a fight. I’m seeing this in eastern Europe. I saw Viktor Orban in Hungary. He’s opened up a center against anti-Semitism. I saw Sebastian Kurz in Austria, he just held a conference against anti-Semitism, and that’s encouraging. But the other side of this is of course education. You have to educate people. In your survey, a third of the people hardly knew anything about the Holocaust. I think education is important and I think a strong, forceful position is important and I’ll tell you what else is important, the State of Israel is important because when we had no state, we were completely defenseless against anti-Semitic forces that annihilated a third of our people. Every third Jew was destroyed. Well, today we have a state, we have capacity to stand up for ourselves and to defend ourselves and that ultimately is the best guarantor against anti-Semitism." Hungary, Poland as well, these are countries where anti-Semitic imagery was used in everyday politics, and yet, nevertheless they have good relations with Israel, their leaders seem to have good relations with you. Is there a contradiction there? How do you reconcile it? "Look, there are old [unclear] that have to be fought, they keep coming back. Anti-Semitism is like a chronic disease. It can be fatal if you don’t challenge it and it can be contained and reduced if you do, and that’s what I expect governments and leaders to do and most of them actually do do it." What about when those leaders both use that anti-Semitic imagery and are strong friends of Israel? "I don’t think they do and I think that ultimately the real issue is can we tolerate the idea that people say that Israel doesn’t have a right to exist, which I think is the ultimate anti-Semitic statement, you know? The majority of the Jewish People are very soon going to be living in Israel. There are over six-million Jews living in Israel. So the new anti-Semites say this: we’re not against Jews. We’re just against the State of Israel. It’s like I would say I’m not against French people, I just don’t think there should be France. France shouldn’t exist. And so anti-Semitism and anti-Zionism, anti-Israeli policies, the idea that the Jewish People don’t have the right to a state, that’s the ultimate anti-Semitism of today. "I talk about Zionism. You know, we’re sitting here in this interview about 200 meters from Mount Zion. Mount Zion is the mountain in the center of Jerusalem where King David proclaimed Jerusalem as the capital of the Jewish People 3,000 years ago. And Theodor Herzl, the modern Moses who led our people to reestablish a Jewish state here called this national movement Zionism based on this mountain right here. So when people say: I’m not an anti-Semite, I’m anti-Zionist, they’re basically saying: the Jewish People shouldn’t have a state, and the Iranians say it even more bluntly – not only shouldn’t they have a state, but we’re going to annihilate the six million who are here. We’re going to deny that there was a Holocaust that killed six million Jews while we’re planning the next holocaust for the six million who are here. Well, as we say: That ain’t going to happen because we’re not going to let it happen. But I think that anti-Semitism has to be exposed. Anti-Israel policies of the kind that say…not criticism, that we can accept, but to say: You don’t have the right to have your own state, we who have been here for 3,000 years, actually closer to 4,000 if you include Abraham? We don’t have a right to exist?! If we don’t have a right to exist, nobody has a right to exist. And I think that that particular prejudice against the Jewish People has to be countered, and I’m glad to see leaders like the president of the Czech Republic who was just here, Milos Zeman, saying: If we betray Israel, we betray ourselves, and he said in a previous speech, he said: I’m a Jew. Because the Jewish People carried the battles of western civilization and I identify with that, and this is the deepest meaning of anti-Semitism. It really goes against the whole idea of the development of western civilization and of human enlightenment and freedom. Israel is not above criticism and we’re [inaudible] it very often, and especially the idea that we don’t have a right to exist, well, frankly I’ll combat it and if people don’t like it, let them not like it. We’re here. We’re going to stay here." Are you confident about the future of Jews in Europe? "I think it has to be protected and we expect every government to act to protect Jews, just as they would act to protect anyone living there, and many are. Individual Jews have a choice. They can always come here. But we respect their individual choice, but I also expect, and actually see, that the governments of Europe, by and large I have to say just about every one of them, acts to fend off these attacks because they’re wrong in their own right and also they’re wrong, they’re dangerous for the societies [inaudible]. I’m glad to see this policy pretty much across the board." Prime Minister, thank you for your time.